Ales Padelek scored the winning goal for Phantoms in Basingstoke. Peterborough Phantoms made a winning return to NIHL Division One South action last night (October 13). Slava Koulikov’s men stretched their successful streak to four games in all competitions with a 2-1 triumph at reigning champions Basingstoke. Netminder Jordan Marr was Phantoms man-of-the-match in Basingstoke. 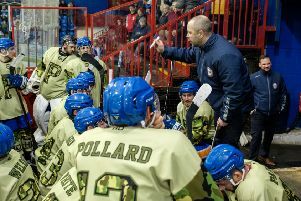 The Bison are a much-changed outfit to that which pipped Phantoms to league and play-off glory last term, but they are still a dangerous side on their own Hampshire ice. An Ales Padelek strike in the final period settled the contest in the city side’s favour, but they had been reliant on a series of fine stops from netminder Jordan Marr earlier in the contest. “We were the better team in the first and third periods and we deserved the win,” said Koulikov. “Basingstoke were the stronger team in the second period, but our netminder shut the door on them. “You always need your goalie to stand up big when you’re under pressure and not for the first time this season he did that. “Basingstoke had five or six very good opportunities but he ensured they couldn’t take them. Basingstoke were dealt an early blow when injury forced their starting netminder Dan Weller-Evans out of the action after just six-and-a-half minutes. His replacement Alex Mettam was soon beaten as Phantoms hit the front when captain James Ferrara bundled the puck in a couple of seconds before the mid-point of the opening period. Their lead proved to be relatively short-lived as Liam Morris fired the hosts level later in the opening session and the excellence of Marr ensured they didn’t concede again when under the cosh in the second period. And it was Phantoms’ who provided the decisive strike early in the final stanza when Padelek restored their advantage with a fierce finish to a Glenn Billing pass. “Basingstoke have a noisy crowd and it is not easy to play there,” added Koulikov. “They also have two good imports and a couple of top-level Brits as well. “We played the style of hockey I felt would enable us to get the result and we’re very pleased with the two points. “We had to win a lot of individual battles within the team plan. I could go through the roster and give praise to every player in every position. Phantoms have the opportunity to extend their hot streak when hosting Streatham in an NIHL Division One South clash at Planet Ice tonight (October 14, 5.30pm).